We recently had a free account holder send us a nasty email accusing us of being scam artists with regards to our billing policy and demanded their account be closed. As such, we have updated our billing policy to address their misconceptions. In our entire history we have never actually applied a late fee to an account and we’re always happy to work with our customers to address their concerns. 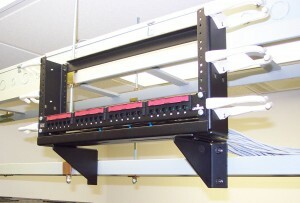 Today the distribution panels were mounted and the conduit attached to the UPS. All of the conduit and panel installations are just about done, at which point we’ll be waiting for a custom 400A panelboard to arrive in order to finish it out and power everything up. We have a few pictures we’d like to share for this update. We’ve moved UPS #1 into position in the electrical room where it awaits its electrical connections. As before, the blue tape on the floor marks equipment footprints and helps us position everything with appropriate clearances. The unit is heavy enough that it’s indented the composite tile floor where it’s sitting, however the slab underneath is 14″ fiber reinforced concrete intended for industrial loads, so we don’t have to worry about about equipment point loads in here or in the server room. It also makes an excellent mounting surface for concrete anchors. This is a view into the electrical room through the door. UPS #1 is immediately to the left, while units #2 and #3 will be placed in a clockwise manner (which you can see in the diagram taped to the far wall). 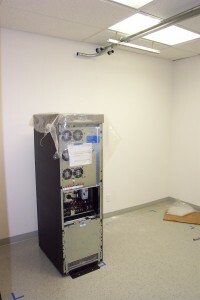 The black box is the paralleling panel board with its internals laying on the floor. The breakers and bus bars were removed to prevent damage and drastically reduce weight (it’s 200 pounds fully assembled) for installation. The empty space to the right will contain two distribution panels to be installed on Monday. Moving on to the server room, we’ve finished installation of the overhead wireways and started to temporarily place some racks and panels to get a feel for the installation. So far everything is lining up exactly as planned. 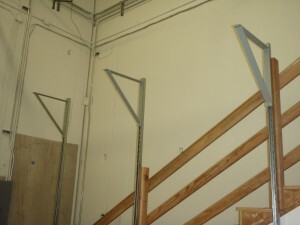 These are the hinge-top wireways that will contain all of the electrical wiring in the server room. Rack outlets will be attached on the opposing side. 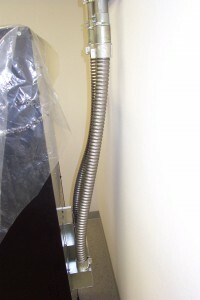 You can also see the conduit through the ceiling that connects to the telco room upstairs. What’s that black thing bolted to the side of the lower ladder rack, you ask? This nifty piece of hardware is called a “patch rack”. It’s basically a 4U mini rack that we’re using to place permanently wired patch panels at strategic locations in the overhead space above the racks. We can do this because we operate a closed floor, escorted access only facility. This allows us to do little things like this to give our customers extra space to work with in their racks rather than taking it up with our equipment. 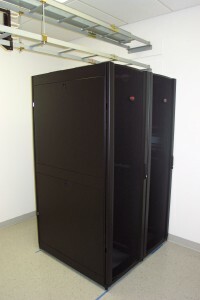 And finally, it wouldn’t be much of a photo update without a picture of some racks. These are the four post enclosed cabinets we’re using as standard equipment. The two in this picture are in the planned position right on their blue tape markers and will eventually be leveled and bolted to the floor when the time comes. You can see the patch rack and hinge-top wireways in the overhead ladder racks. Our phone lines are scheduled to be moved to our new office the afternoon of September 29. However, the Verizon circuit has still not been re-provisioned correctly and we don’t have any IP service. Because of this we can’t move our VOIP concentrator to the new office and we will be unable to take calls to our main number (775-284-0383) until further notice. We will set up a temporary system with some old hardware to answer the lines and take voice messages as a workaround. UPDATE 10-20-2009: Phone services have been restored. 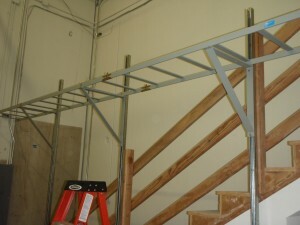 The ceiling in the back where the electrical service entrance is 25 feet, so we installed this ladder rack to bring it down to 9 feet in order to ease installation and future additions. 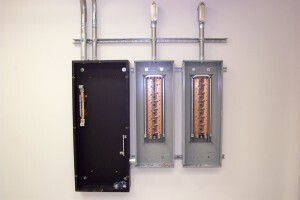 It also drastically reduces the installed wire footage. 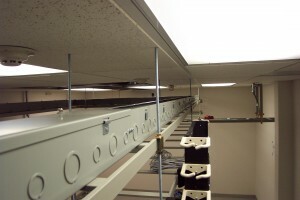 At the top of the frame you’ll see a set of three conduits on a rack secured to the wall – those carry the fiber optic lines, electrical, and copper to the telco room upstairs (anything secured to channel strut is ours). Those were a chore to install and required the use of a scissor lift, something we’d prefer to avoid for the multiple heavy gauge runs of the UPS mains, bypasses, and generator feed. We’ll be adding a fourth conduit to the ceiling run for the server room air conditioner – which will also be housed on the second floor – as soon as we can get the lift again. The unpainted section on the concrete wall used to house a large haphazard phone board (which we promptly removed) and will be the future home to our additional electrical service panels to support the UPS room and generator transfer switch.